Generally speaking, the property that you owned before marriage (“non-marital property”) is yours to keep after marriage, and the property that you acquired during marriage (“marital property”) must be divided between you and your spouse upon divorce, regardless of how the property was titled at the time it was acquired. While this is fairly straightforward, Nebraska courts have struggled with how appreciation earned during marriage on non-marital property should be divided. The law regarding appreciation during marriage has recently changed, which makes it important to understand old Nebraska law compared to current Nebraska law. Old Nebraska Law: Prior to July 14, 2017, Nebraska courts were hesitant to divide appreciation earned on non-marital property during marriage. Typically, appreciation would only be divided if the “non-owning” spouse had gone to extraordinary lengths to cause the appreciation for the owning spouse. This old system was known as “passive appreciation,” because if the non-owning spouse took no effort to cause the owning spouse’s property to appreciate during marriage, then the non-owning spouse was not entitled to any of this appreciation upon divorce. For example, Sally owned a business worth $0 before marrying John. During their marriage Sally worked hard and her business boomed, and by the time that Sally and John filed for divorce, Sally’s business was worth $10 million. Under the old Nebraska rule of “passive appreciation,” John would not be entitled to any of the appreciation in Sally’s business unless John had put in a great deal of effort of his own to help Sally grow her business. Sally leaves the marriage with $10 million in business assets. John leaves the marriage with $0. Nebraska courts would sometimes feel that such results were unjust under the law, and would thus issue “Grace Awards” to attempt to make divorce more equitable for the non-owning spouse, awarding a portion of the appreciated, non-marital property to the non-owning spouse. 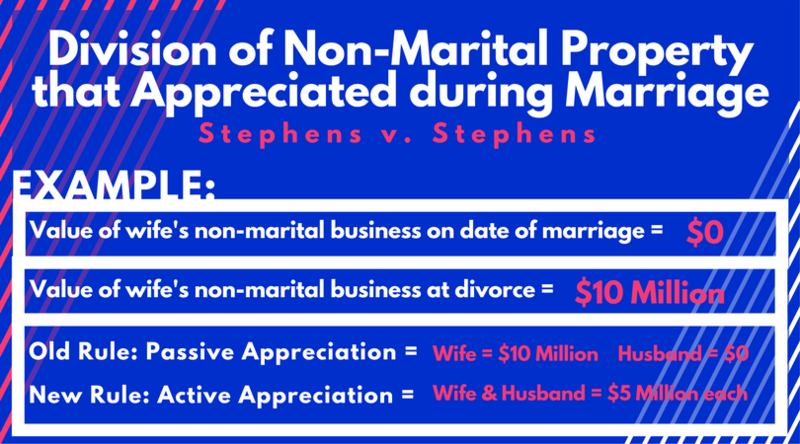 Current Nebraska Law: On July 14, 2017, the Nebraska Supreme Court issued a new ruling in the case of Stephens v. Stephens that changes the way that Nebraska courts divide appreciation on non-marital property. This new rule is called “active appreciation,” and it is a complete reversal of the old way Nebraska courts divided appreciation. Now, Nebraska courts will presume that all appreciation accrued during marriage on all property (including non-marital property) should be divided between spouses so long as either spouse took actions to cause such appreciation. Going back to the example of Sally and John, now upon divorce the appreciation on Sally’s non-marital business will be divided between Sally and John so long as either Sally or John helped the business to grow. Sally now leaves the marriage with $5 million in business assets, and John now leaves the marriage with $5 million in business assets. Accordingly, the old system of “Grace Awards” is obsolete. Businesses, real estate, paintings, etc.—it is important for you to keep in mind that when filing for divorce, this new Nebraska Supreme Court rule will impact the appreciation earned on virtually all of the property that you and your spouse owned during marriage.